Angioplasty of the leg arteries is a procedure to open up narrowed or blocked arteries (blood vessels) in your leg so blood can flow better. It’s one treatment option for a condition called peripheral arterial disease. A vascular surgeon or a vascular radiologist will perform your angioplasty. A vascular radiologist is a doctor who specialises in using imaging to perform minimally invasive procedures. They use X-rays and magnetic resonance imaging (MRI) scans to insert a catheter (fine tube) in your body (usually in an artery) to treat a problem internally. You’ll meet your vascular surgeon to discuss your care, and later your results. This may differ from what’s described here as it will be designed to meet your individual needs. Your doctor will explain how to prepare for your angioplasty. If you smoke, they may ask you to stop because it increases your risk of the artery blocking again, and slows your recovery. Tell them before the procedure if you know you’re allergic to iodine or any other X-ray dye. You might need to stop taking certain medicines but check with your hospital before you stop taking them. The procedure is usually done through a large artery in your groin. You might need to shave around this area but check with your hospital first. Angioplasty is usually done under local anaesthesia. Your doctor will inject this into your groin. It will completely block pain in your groin and you’ll stay awake during the procedure. They might also offer you a sedative, which will help you to relax. You might need to stop eating and drinking six to eight hours before your angioplasty. But check with your hospital and follow your surgeon's advice. If you have any questions, just ask. Your doctor will discuss with you what will happen before, during and after your procedure, and any pain you might have. This is your last opportunity to understand exactly what will happen. You should have talked through everything in detail before you’re admitted to hospital, and asked questions about the risks, benefits and alternatives to the procedure. You should then be in a position where you understand everything so you can give your consent for it to go ahead. You’ll be asked to sign a consent form before the operation. What are the alternatives to angioplasty? See our topic on peripheral arterial disease for more information about these. Your doctor will advise you which type of treatment is best for you. They’ll usually only suggest you have angioplasty if your symptoms are severe, and other treatments don’t work or aren’t suitable for you. If you have an angioplasty and it doesn’t work, or it isn’t a suitable treatment for you, you might need to have bypass surgery instead. This involves directing your blood around the blocked artery instead of through it by attaching an artery graft above and below the blocked area. What happens during angioplasty of the leg arteries? Angioplasty usually takes about half an hour to an hour. You’ll usually have an angiogram in the X-ray department of a hospital. Your doctor will make a small cut, usually in your groin, and thread a thin flexible tube called a catheter into an artery. They’ll inject a dye (called contrast medium) into the catheter. This will help to show any narrowing or blockages in the blood vessels in your leg. You shouldn't feel the catheter inside your blood vessels, but you might feel a warm sensation when they inject the contrast medium. Your doctor will use live X-ray pictures to help them guide the catheter to your blocked artery. They’ll then pass a thin wire with a balloon on the tip through the tube to the blocked or narrowed part of your artery. Once it’s in place, they’ll inflate the balloon to open your artery and allow blood to flow more easily. Sometimes, a very small wire mesh tube called a stent is used to keep your artery open. 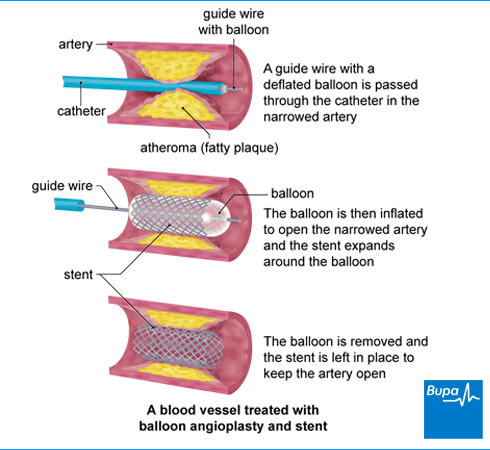 A collapsed stent will be put into your artery, usually along with the balloon. When the balloon is inflated, the stent will expand and pop open your artery wall. The balloon is then deflated and taken out, leaving the open stent in place. Stents are usually made of metal (bare-metal stents) and some have a drug coating on them, which are called drug-eluting stents. The drug is slowly released into your artery to stop it closing up again. Your doctor will let you know which type of stent you’ll have. After the procedure, your doctor will remove the balloon and catheter. They might use a ‘plug’ or similar device to seal the hole in your artery. Alternatively, they may press on the area for about five or 10 minutes to make sure your artery closes and any bleeding stops. The procedure shouldn't be painful, but may feel slightly uncomfortable. After an angioplasty, you'll need to lie flat on the bed for an hour after the procedure. You’ll then probably stay in bed for another three hours to recover, but follow your doctor’s instructions. It’s possible that you’ll need to stay in hospital overnight but most people go home the same day as the procedure. They may also give you a date for a follow-up appointment. When you’re ready to go home, make sure someone can take you. And ask someone to stay with you for a day or so while you recover. If you had a sedative, it can really take it out of you. You might find that you're not so co-ordinated or that it's difficult to think clearly. This should pass within 24 hours. In the meantime, don't drive, drink alcohol, operate machinery, or sign anything important. Looking for prompt access to quality care? If you need something to help with any pain, you can take over-the-counter painkillers, such as paracetamol or ibuprofen. Always read the patient information leaflet that comes with your medicine. If you have any questions, ask your pharmacist for advice. The time it takes to get back to work will depend on the type of work you do. But most people are able to return after a few days. You should be able to drive after 24 hours too. It’s important to take care of yourself while you’re recovering. Don't lift anything heavy for the first few weeks after your angioplasty. You can usually have a shower 24 hours after your procedure but don’t have a bath for at least a few days. As with every procedure, there are some risks associated with angioplasty of the leg arteries. We haven’t included the chance of these happening as they’re specific to you and differ for every person. Ask your doctor to explain how these risks apply to you. Side-effects are the unwanted, but mostly temporary effects you might get after having an angioplasty. You may have some bruising around your groin where the catheter was put in. If your leg becomes red and swollen or smells when you get home, contact your hospital where you had the procedure. If you can’t get hold of them, call your GP. If your leg becomes cold, painful or numb, contact your doctor urgently or call an ambulance. Complications are when problems occur during or after the angioplasty. Although they’re rare, possible complications are listed below. Bleeding from your wound can sometimes be severe. If this happens, you may need to have a small operation to repair your artery. Arteries treated with a stent can become narrow again. This is called restenosis. It’s more likely to happen within the first year of having the procedure, if the cells covering the stent grow too quickly. If this happens, you might need to have another angioplasty. You might have an allergic reaction to the dye used during the procedure. This could be a rash, or it could be a more severe reaction that causes swelling and affects your breathing. This will be treated quickly if it happens. Your artery may become completely blocked during, or soon after, the procedure. You may need to have the angioplasty done again. The tip of the catheter can dislodge a clot of blood or fatty material from the wall of a blood vessel. The blood vessel being treated can be torn during the procedure. This may need an operation to repair it. Can I reduce my risk of blood vessels narrowing? Can I reduce my risk of blood vessels narrowing? The best way to improve blood flow in your body and reduce your risk of your blood vessels narrowing is to lead a healthier lifestyle. An angioplasty opens up your arteries and improves blood supply to your legs, but it isn’t a cure for peripheral arterial disease. It can’t stop more fatty deposits building up in the future. But there are lots of things you can do to help keep your blood vessels healthy. Stop smoking. If you need help giving up, ask a pharmacist or your GP for advice, or read our tips on how to quit. Keep active. Choose something you enjoy and build activity into your day-to-day life. Keep to a healthy weight and eat a healthy, balanced diet. For tips and advice on improving your lifestyle, see 'Related information' below. If you have long-term health conditions, such as high blood pressure or cholesterol, managing them will help to reduce your risk of blood clots forming. Ask your GP for support with this. Is it safe to do exercise after leg angioplasty? Is it safe to do exercise after leg angioplasty? Exercise is not only safe to do after an angioplasty but is actually really important as it helps to improve the blood flow in your legs. Take it easy for the first few days after your angioplasty and only do gentle activities, such as going for a slow walk. You can then gradually build up the amount of activity you do and aim to do a little bit more each day. Walking is a great way to do this and you can build up the distance you walk as the days go by. After a few weeks, you might want to try riding a bike or going for a gentle jog. If you need advice about what exercise to do, ask a nurse or physiotherapist at the hospital. How soon can I fly after having a leg angioplasty? How soon can I fly after having a leg angioplasty? If you don’t have any complications from an angioplasty, you should be able to fly about five days after your procedure. But check with your doctor before you make any travel plans. It’s important to talk to your doctor before you fly so you can ask them about your risk of developing a blood clot when you travel. It’s also a good idea to speak to your travel insurance company. You can take steps to reduce your risk of developing a blood clot in your legs. Keep moving – walk up and down the aisle of the plane. Bend and straighten your toes, ankles and legs regularly, to help improve the blood flow in your legs. Drink enough water, and hold off on the alcohol. Wear compression stockings – but check with your surgeon first. If you notice any swelling or pain in your calf or thigh during, or after your flight, or have trouble breathing, seek urgent medical attention. What happens if angioplasty doesn’t work? What happens if angioplasty doesn’t work? An angioplasty usually works very well and can reduce your symptoms and improve blood flow in your legs. But this does vary depending on how severe the narrowing or blockage of your artery is. If angioplasty doesn’t work for you, your doctor may suggest you have bypass surgery. The result of your angioplasty will be reviewed by your doctor, who will advise if you need any further treatment, such as a bypass operation. Bypass surgery is an operation to make your blood flow around the narrowed area of your artery, instead of through it. Your doctor will do this by attaching a new blood vessel to your artery just above and below the blocked area. They may use another vein taken from the same leg or an artificial blood vessel. Your doctor will explain the operation in detail and answer any of your questions. Here we give you the facts about the harm smoking does to your body and advice on how to quit.